Poroshenko will discuss the initiative at the UN General Assembly. Ukrainian President Petro Poroshenko will initiate the creation of "an international group of friends for the de-occupation of Crimea" to coordinate joint efforts in this direction. 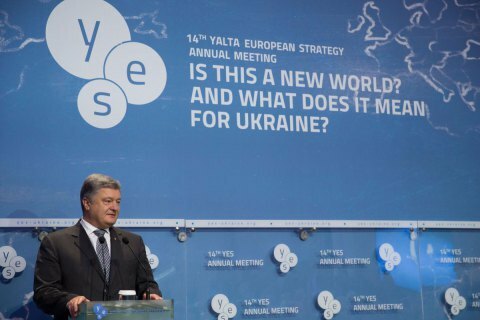 "I plan to discuss this initiative in detail at the UN General Assembly in New York," Poroshenko told the 14th annual meeting of the Yalta European Strategy in Kyiv on Friday, 15 September. Poroshenko said that Ukraine stands for the peaceful ousting of Russia from occupied Crimea. "They need to return what they took illegally," the president added. President Petro Poroshenko said that he would raise the issue of UN peacekeepers' deployment at the UN General Assembly session in September. Gorshenin Institute holds round table "Protecting the defenders: mission (im)possible"